Many of you will have heard of the ‘loudness war’. A typical name for the fact music has been pushed harder and louder for the last decade or more, reducing the dynamic range of the music more and more. Audiophiles will say it degrades the audio quality; removing all the different nuances in the dynamic range and making the music sound less life-like. Supporters of loud music mixed / mastered music will say it simply sounds better. And to be competitive in today’s music industry, you’ll simply need to sound loud as well. Personally I think both sides are right. In the end though, I think it’s up to the producers themselves to decide what is important to them. If they feel they can sacrifice some subtleties for a loud track, why not. 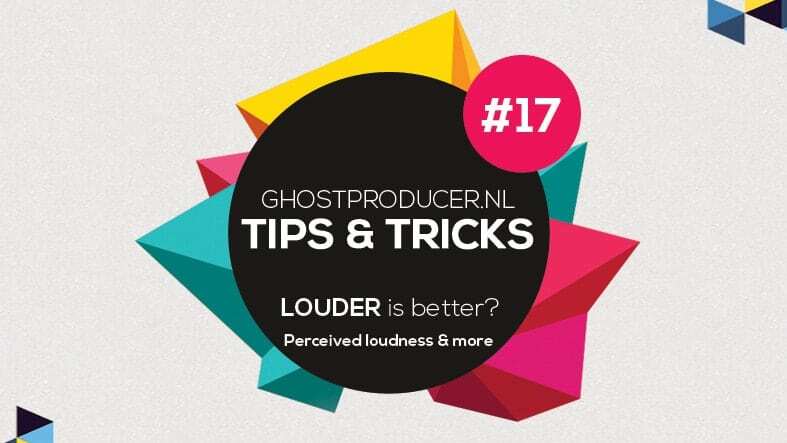 That’s why in this Tips & Tricks, we’ll be focusing on mixing for loudness. If you’ve been producing and mixing for some time, you’ll probably have heard someone say louder music sounds better. And you might have even heard of the Fletcher-Munson curve. What’s that, you ask? Back in 1993, Harvey Fletcher and Wilden A. Munson conducted research on psycho-acoustics at Bell Labs. What they came up with was the ‘equal-loudness contours’. They tested a control group with two tones. One test tone in a varying frequency. Each test tone was then followed by a reference tone at 1 kHz. The test-person then had to say which of the tones was louder according to him. This way, the researchers were able to calculate the differences in perceived volume for the different frequencies. Ultimately, the chart shows how much louder or softer frequencies need to be in order to be perceived equally loud to the test tone of 1 kHz. Now to give you an example using the graph below. If we take the 20 phon curve, you can see the test-tone of 1Khz (or 1000 Hz) is playing with a level of 20 dBSPL. 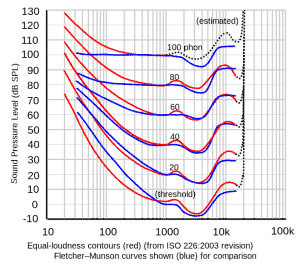 To be perceived equally loud, a tone of 100 Hz would need to be played at a level of 50 dBSPL. So there’s a difference of 30 dBSPL in order to be perceived equally loud. If we take a look at the 100 phon curve, you can see the test-tone of 1 kHz is playing at 100 dBSPL. But if we take a look at a tone of 100 Hz, it would need to be played at 105 dBSPL to be perceived equally loud. This is just a difference of 5 dBSPL, compared to the 30dBSPL of our previous example. So the louder a sound is played; the more even the frequency distribution is perceived by us. Another conclusion is that the louder a song is being played; the more impact this has on both the low and high frequencies. As the difference in perception is biggest in those areas. What also can be seen in the curves is that the mid-frequencies are most consistent, meaning we are most sensitive to them. There are several reasons for this; anatomy of the ears, but also because this is the range where human speech is dominant. So that’s how perceived loudness works. How does this impact our mixes? First of all it’s evident you will need to check your mixes at different levels. Starting your mix at a very loud level will make it increasingly difficult for you to find the proper balance. Ideally, your mix should sound good and balanced on all levels. The key to this are your mid frequencies. Saturation or distortion can help make your mixes sound more level-proof. By using some saturation or psycho-acoustic tricks on your sub bass or kick, you can give them some presence in the lower mid and mid frequencies. This way; even when playing your mix at softer volumes, they will still have presence. This is also the case when playing your tracks at systems that can’t easily reproduce the lower frequencies, such as laptops, tablets, phones etc. By giving your low frequencies some presence through saturation they can be perceived on these systems as well. It’s a win-win, really. Also; because of the bigger difference in frequency perception on a lower volume, when your final mix sounds good on lower volume, it often sounds good at higher volume levels as well. The opposite is definitely usually not the case. Finally there’s another acoustic reason for perceiving louder music as better, more specifically the room’s reflection. The louder the music, the more of the sound is reflected in the room towards our ears, giving a different perspective on the stereo image and creating a sensation the music is all around you. Whilst this might not be ideal for studio purposes, when you generally want a more honest feedback from your surroundings, a lot of your listeners are simply enjoying your music for their pleasure in their non-acoustically treated rooms. In which case again; they will perceive louder as better. I hope with this explanation you’ll have more of an understanding how loudness and more specifically perceived loudness works and how this will affect your mixes. And even more so; I hope this information, and these tips, will help you understand what you can do to make your mixes translate better on different volumes, so they can be enjoyed on different volumes and on different systems. So, that’s it for now. Hope this information helps you with your tracks. Happy producing! And if you need any help, you know where to find me!